A quick spec check of the new Maruti Suzuki DZire against its arch-rivals. The third-gen Maruti Suzuki DZire is all set to go on sale across the country. Bookings of the new compact sedan are already open and we’ve already got a detailed look at it during the official unveil a couple of weeks ago. Now, while it’s a given that the new model will straightaway go on to become a best-seller for Maruti Suzuki - let alone dominate its segment on the sales front - that doesn’t automatically mean that it’s the best car in the segment. When launched, the DZire will face stiff competition from its rivals. So let’s see if it has got the measure of its rivals on paper or not. 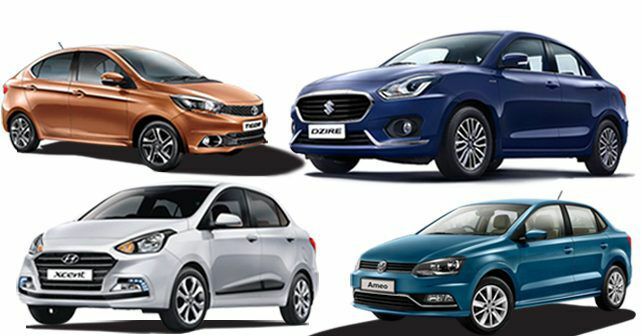 We’ve compared the new DZire with its fairly new rivals, namely, the Hyundai Xcent, Tata Tigor and Volkswagen Ameo in this story. The Honda Amaze and Ford Aspire are still capable products but feel a little outdated now, so we’ve skipped these two in this spec-comparison. The new DZire is based on an all-new platform, dubbed Heartect. Thanks to this, it’s now wider and lower than the outgoing model. While the overall length of the car is unchanged at 3,995mm, the wheelbase has increased by 20mm to 2,450mm, liberating more room inside the cabin. Now, compare its dimensions with its rivals (check the table below). Length wise, all four cars here are more or less the same – thanks to their sub-4m roots. The new DZire, however, is the widest car of the lot. Surprisingly, the Tata Tigor has the same wheelbase as the DZire, and it’s the Hyundai Xcent that’s the smallest wheelbase and is the narrowest of the four. The Tigor’s ride height is also highest at 1,537mm while the Volkswagen Ameo is lowest at 1,483mm, though, the Volkswagen has the largest wheelbase in this group. Another area where the Tigo trumps the other three is in boot space department. The Tigor’s boot at 416 litres of space is the largest, followed by Xcent at 407 litres, DZire at 378 litres and Ameo at 330 litres. All the cars listed here will be offered with both petrol and diesel engines. Let’s start with the DZire. Maruti has decided to retain the powertrains of the old model - 1.3-litre diesel and 1.2-litre petrol - in the new car. The engines, however, have been fiddled with to return even better fuel economy. In addition to that, both the petrol and diesel engines will come with a 5-speed AMT as optional. A five-speed manual is standard. The Xcent is evenly matched, too. It gets a 1.2-litre petrol and a 1.2-litre diesel engine on offer. It also comes standard with a five-speed manual, albeit there’s no automatic available for the diesel version. There’s only a 4-speed automatic available with petrol. The Ameo’s engine options show a stark difference. The petrol version is powered by a sedate 1.2-litre motor, while the diesel gets a 1.5-litre unit that’s not only the biggest in this lot but also the most powerful. What’s more, the diesel Ameo can be paired to a 7-speed DSG automatic gearbox, which should make it unmatched in terms of performance here. Even with the standard five-speed manual, the Ameo diesel should be the quickest and most entertaining car here. In comparison to others, the Tigor gets three-cylinder petrol and diesel blocks. But, as you can see, the engine develops a decent amount of power and torque. The Tigor only comes with a five-speed manual as of now. While Maruti hasn’t yet revealed all the details of the new DZire, we’re expecting it to be as feature-rich as it gets. And it has to be that way because all of its competitors are really well-equipped. Among some of the features that we’ve already seen in the new DZire, it’ll come with a touchscreen infotainment system with Apple Car Play and Android Auto connectivity, rear parking camera and sensors, LED projector lamps, rear AC vents, 15-inch alloy wheels, LED tail-lamps, push-button ignition, automatic climate control and electrically foldable and adjustable ORVMs. The other three sedans are also brimming with such features and more, though. Take a look in the table below. The new DZire will be fitted with ABS, dual airbags and ISOFIX seats as standard. The Volkswagen Ameo also comes equipped with ABS and dual airbags as standard. All the versions of the Tata Tigor – barring the base trim – get ABS with EBD and dual airbags. The Xcent comes standard with dual airbags, but only the higher variants are offered with ABS. Update on 16/05/2017: The Maruti Suzuki DZire has been launched in the country. As you can read in the table below, the new DZire's prices - barring the top-end petrol automatic - are neck and neck with its arch-rivals, Hyundai Xcent and Volkswagen Ameo. The Tata Tigor, however, undercuts all three by quite a margin, albeit it loses out on a few niceties in exchange.